Whether you have 4 or 5 speed, 6 cylinders or V8, Rally or Rallycross, or other motorsports, this is a simple to use Dogbox Kit. For BMW M3 E36/E46 or any other 6 cylinder or V8 engines we have 4 or 5 speed ratio versions. This gearbox is very light and simple in use, widely used in circuit and rally, rallycross, and in any other motorsport discipline. 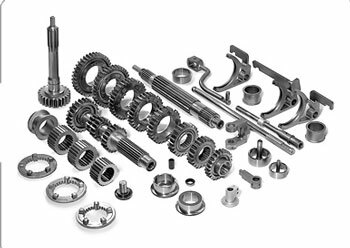 Gears of highest quality and forged steel. New type straight cut and special profile teeth for minimum rolling resistance and maximum strength. Special design 5 dogs to make gear shifting on high revs easy and smooth. All selectors, shifting fingers, protections, forks, rods are made from billet steel for maximum reliability. Ratios: *specify in order notes.